Lonworks basics,Lontalk protocol in IoT | What is Lonworks? This page covers Lonworks basics and Lontalk protocol.Lonworks is used in IoT(Internet of Things). Lon worker devices including Lonworks gateway is also covered. Lonworks stands for local operating network. It is one of the powerline communication technologies used for home automation and building automation. The technology is developed by company called Echelon. It is an open standard for all the manufacturers. Lonworks has replaced centralized automation control system architecture into highly distributed peer to peer architecture. As mentioned there will not be any centralized controller here and all the Lonworks devices (i.e. nodes) communicate with other nodes on whatever medium is available using standard protocol. Lonworks supports physical mediums such as twisted pair, power line, RF, fiber optics, infrared and coax. Hence different data rates and distances can be achieved in Lonworks system based on medium. Here each mode has its own application program and hence control logic is distributed throughout the Lonworks system. Lonworks technology is developed based on contributing elements such as Neuron chip control processor, transceiver, Lontalk protocol and Lonworks network services. Neuron chip control processor: This SoC device consists of multiple processors, RAM, ROM and interface ports. ROM houses operating system, Lontalk communication protocol and I/O library. RAM contains configuration data and application program which are downloaded to it using network. Each Neuron chip stores 48 bit unique ID referred as Neuron ID. Transceiver: It is a interface between neuron chip and channel(i.e. physical medium). Lontalk Communication protocol: It is a layered, packet based and serial peer to peer communication protocol. Lontalk ptotocol is media independent. It is designed for the requirements of control systems and not data processing systems. Let us understand Lontalk protocol process. • Devices transmit packet on a channel turnwise. Packet is variable in size and contains application layer information. It contains addressing and other network related information. Hence packets are of two types viz. one containing application layer packet and the other network management packet. • Every device receives the packet and checks the address to determine whether the packet is addressed for it. If so it decodes and takes action based on packet type. If the packet is network management type then processed accordingly. If it is application layer related then it is passed to the respective application program. ACK message is sent if required here. Lonworks network services: It is a client server achitecture used to provide interoperability between Lonworks network tools. The software design will enable tools wo install,maintain and monitor and control the networks. Lonworks devices: Also referred as node. It contains neuron chip and transceiver with power supply. It can act as sensors and actuators depending upon functionality. As mentioned all the devices will have unique Neuron ID. Channels: It is a physical medium which is used by group of Lonworks devices. The devices use transceivers in order to communicate over the channel. Network tools: They are basically software programs which reside in neuron chip or PC. These programs are used for network installation, network configuration, monitoring, maintenance and supervisory control. 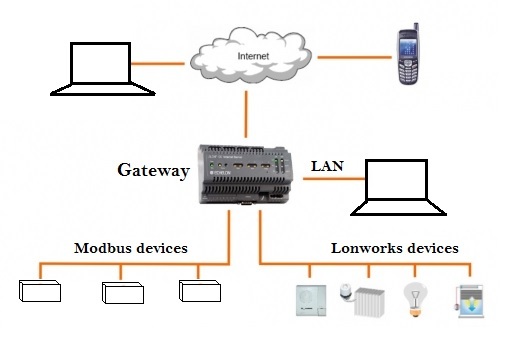 Figure depicts Lonworks system mentioning Lonworks gateway which interfaces Modbus and Lonworks protocol devices. 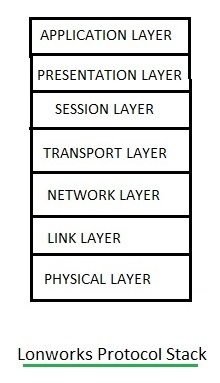 The Lonworks protocol stack consists of physical layer, link layer, network layer, transport layer, session layer, presentation layer and application layer. Following are the Lonworks gateway manufacturers. It is basically a protocol converter. • Sierra Monitor Corporation • Control Solutions, Inc. Minnesota, USA • LG Electronics • Efficient Building Automation Corporation,CANADA • Renu electronics Pvt. Ltd, Pune INDIA. • DAIKIN INDUSTRIES, LTD, JAPAN. Chipkin Automation Systems has developed Lonworks gateways for various protocol conversions as listed below.